Google Chrome is showing new information in the certificate section. Is this a big deal? If so how can I fix it on the server end? 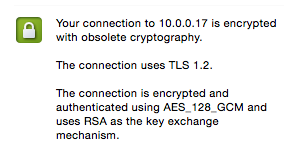 EDIT: Thanks for the answers but I'm not skilled in cryptography so the only thing I can update with is this certificate was created by Shell in a Box, and I was also wondering if this was ruining the security of TLS/SSL communication with the application and if so, how I could fix it. Your exact case is that RSA is used as the key exchange mechanism. Instead, you should use DHE_RSA or ECDHE_RSA. This has nothing to do with a certificate. There is a special "outdated security settings" warning when a certificate uses weak signature algorithm, but this is about authentication, not about encryption. Note that you are still getting a green lock, even in case of obsolete encryption. According to this page. The former is a configuration issue, the latter require you to get a certificate signed with a SHA-256 hash. I had the same issue and used this free service to get a: SSL report. Handshake simulations for different browsers and OS. It helped me get information about how my configuration was set, what could be improved or disabled and I ended up modifying the ssl_cipher directive from Nginx to support the Intermediate compatibility. Since the protocol version is good and AES_128-GCM is certainly not obsolete the remaining possibility is that something is wrong with the RSA key exchange. I'm not sure what google chrome understands as obsolete, but just the fact that key exchange is performed using RSA is not particularly good. Preferably RSA should only be used for authentication and the key exchange should be performed using DHE or ECDHE. As someone pointed out you might also be having a problem with your certificate which is either signed with a bad hash function or the key might be too short (512 bits?) the latter is not very probably though. Not the answer you're looking for? Browse other questions tagged cryptography chrome or ask your own question. Insecure https connection to reputable companies' domains?